Last Easter I was fortunate enough to spend a day at the Secret Garden Outdoor Nursery in Fife. It was one of those magical days which remain etched in my memory for many reasons. I was particularly bowled over by the numerous examples of literacy happening spontaneously. Very often, this is a concern raised by educators and parents... are the core skills being covered such as maths and language and if so, how, when children are playing in the woods? When I was fresh out of teaching college, I had no idea what literacy entailed. I had no idea about what little children could achieve. I certainly did not think there were more than a couple of minor outdoor applications such as writing poetry or setting up a treasure hunt. I think I probably would have immediately jumped to the bunting (created by older children) below as evidence of literacy and would have felt that the lack of alphabet letters and jigsaws was a questionable approach. Beyond print in the environment, such as the plaque in the photo below, there is a culture of assumption that literacy happens inside. That it needs adult intervention. That magnetic letters, reading corners and writing tables are what literacy is all about. One challenge is that most people look to the curriculum for guidance here over standards and expectations. Whilst I believe that it is helpful to embrace a curriculum, heavy petting with it needs to be firmly avoided. I'm not being educationally prudish. I just know that slavish following of any curriculum is rarely, if ever, based on any child's needs and interests. However, the beauty of getting to know a curriculum can be working out how to interpret it in a flexible way that puts children first. At the Secret Garden this happens. 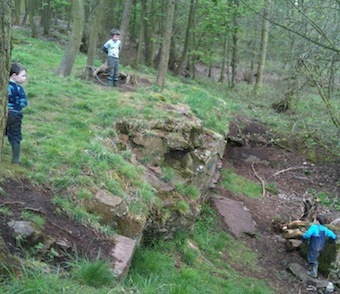 The curriculum has been developed around the children and their play experiences in nature. What immediately struck me was the sound of the children's voices. The woodland rings to their laughter and chatter. The children play and interact really well with lots of communication and collaboration. For example, in the photo below, the group of boys spent a long time working together to set up a seesaw behind this tree in the middle of a nest they had built. Such social activities really aid oral literacy and confidence in speaking. Very often children who have difficulty speaking to adults will freely chat to friends. Furthermore role play where children become other animals or characters helps develop empathy and an understanding of characters. Every good novel has decent characters in it! Lunch time and snack time provided a structured social opportunity with high levels of interaction between the children. They compared food in their lunch boxes. When something needed to be shared such as hand wipes, the children were proficient at passing the items around the circle. There was lots of chatter about ongoing seasonal events and recalling of the play happened earlier in the day. The coming together to share experiences over a bite to eat was also an opportunity to share stories and songs. Before lunch, there was a sing song. Songs help children learn the patterns and rhythm of language. Then, as children were finishing their lunch, Cathy told a story orally to the group, who listened actively and joined in all the actions and repetition. At one point in the afternoon, a group of children went along to the raised beds. They had discovered a worm and thought it would be a good place to put it. Again more discussion was had about the needs of the worm. The spoken word usually precedes the written word in language development. Spontaneous talking and listening is a vital part of any literacy approach - knowing what to say and how to say it. One of my favourite parts of the day was observing a group of children gathered around a table. As you can see in the photo, there was a bird identification chart that was the focus of a prolonged discussion lasting a good twenty minutes. The children were discussing the different black birds they knew about and had seen. There was lots of referring to the illustrations and text. One of the lovely aspects of the Secret Garden is that items children bring along to the nursery are welcomed. There is no discouragement or a box where such items are deposited for collection at the end of the session. 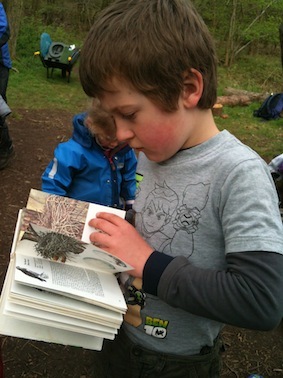 The use of nature as a literacy-rich environment is further enhanced in subtle ways. 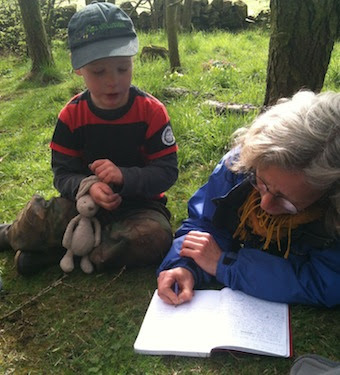 From discussions with children, it turned out that every child has a map of the woodlands. This is used and referred to at home. The children have named the different parts of the woods and use these to locate specific areas where they have played. This is a useful reference for parents as part of the sharing of ongoing nursery events and activities. As with all pre-schools, the Secret Garden acknowledges the transition between nursery and primary school. For a number of years, each child who moves onto primary school has been given the gift of a book. It is a second hand copy of an adult book about birds eggs and nests. It is hugely popular. As it was the Easter holidays, a couple of Primary 1 aged children were visiting the Nursery. 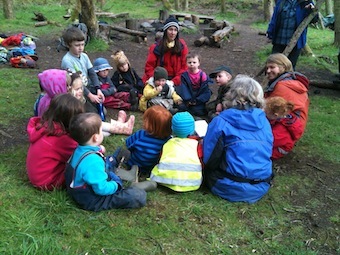 This was a lovely opportunity for these children to re-visit and re-live the experiences of the woodland. Cathy asked a child to show me his book. She said that the returning children always brought their bird nest book along, which suggests this present is valued and enjoyed. There are many practical activities which precede literacy acquisition. The model in the above photo is an example of a miniature world carefully created by two children. They were totally absorbed in creating this for more than an hour. This sort of activity helps children understand and create settings when developing stories. Mark making comes in various guises and forms. Charcoal is considerably easier and cheaper to acquire when an old fire has burnt out at a pit. The mark making was another prolonged activity for several children. They also ended up marking their hands and faces too! The record keeping is almost entirely electronic. Photos are used as a method of collecting evidence. These are uploaded daily, tagged and organised into each child's folder promptly. Any photos not given this treatment are deleted. Often the photos taken during the day are used in a reflection activity where children recall their experiences and use them to think and plan ahead. 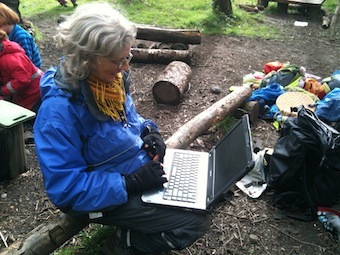 The use of a laptop in the woods serves to show the children that digital literacy is part of our culture and can be a useful tool when used appropriately. On the day I visited, the children's thoughts were being noted in a book. The adults scribed the children's comments in the book, thereby modelling the writing process. At the end of the day, each child's entry was read aloud and shared with the whole group for further comment and conversation. Being outside in the real world helps children build up knowledge about their environment and their conceptual understanding. Without real world experiences, children can struggle to make sense of words and pictures in written texts. For example, a story about a river will make less sense to a child who has never seen a river or played with water. Somehow seeing the world through a widescreen TV indoors simply doesn't crack it by comparison. Reading and writing are complex processes. If you have ever had a child struggle to learn to read or write then an assessment may be undertaken that considers the different factors which impact on a child's ability to read or write. These include gross and fine motor skills, visual perception skills, auditory and visual sequential memory, visual closure and spatial relationships to name but a few. Speech and language therapists and other professionals often suggest very practical approaches to further developing these skills which rely on games and activities which lend themselves to outdoor play. This is for another blog post. Although my day at the Secret Garden Outdoor Nursery was very much a snapshot of a moment in time, I hope it serves to illustrate the potential of woodland play to facilitate literacy acquisition. I am not an early years literacy expert and would welcome any constructive criticism and debate around the points I've made in this blog post. Many thanks to Cathy Bache, Lesley, Morven and all the children at the Secret Garden for making myself and Siw and Magnus Linde welcome in their woods. May your voices always be heard in the woodlands and beyond. May your story be listened to and your song sung now and in the future. Hi Brenda - If you like, I can send you my html code and you can repost the blog - as long as you state that it's a guest blog from myself. I'm just going to have a look at your blog - it's always good to meet other bloggers especially those blogging about children, nature and the outdoors. this is a great way to connect reading with nature. so many ideas going through my heart -and head to share with my kids at work! thanks for sharing an encourging letter. I teach art in nature classes and have a blog to encourage parents to get outside and play with the children. would love to add this idea too! Isn't that wonderful and encouraging. I feel what is important is that in all walks of life there are ambassadors for getting children outside. So in many ways, whatever someone ends up doing, they can influence others in little or big ways. It certainly is. I will follow your blog in the future. I like how you place a positive emphasis on allowing children to roll up their sleeves and get their hands dirty. I have raised four kids that way and even now, as adults, they still love the outdoors. My eldest, who is an accountant, will say he is really a farmer at heart. Thanks ELizabeth - I have a blog, I'm a teacher, get me OUTSIDE here! where I post regularly. But this post I thought was especially relevant for others on this C&NN site. What great examples of how nature can spark a love of learning. Thanks for sharing this.